The George Lwandamina led technical bench made a few changes to the team that drew 0-0 in Beira last week by bringing in Maybin Mwaba and Lazarous Kambole in the starting line-up. The defence was maintained with Charles Siyingwa being put on the substitution bench. Other inclusions that were made to the team were John Ching’andu who replaced Jackson Mwanza and Brown Nyirenda who replaced Jacob Banda who picked up an injury during training. In the first half Zesco mounted pressure on the visiting side that resulted in a goal by Last seasons’ Club Top Scorer Winston Kalengo after an intelligent pass by Maybin Mwaba. The home side had a lot of chances by the strikers but the alert Da Beira Willard Manyatera kept the ball away from the net. In the second half the visitor’s put pressure on the home team but the defence stood firm and could not allow them a goal. 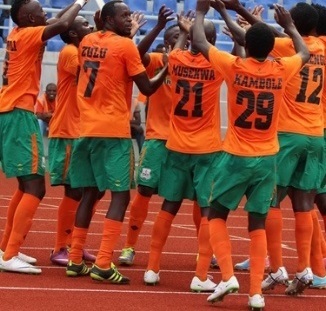 The win means Zesco progresses to the next round of the CAF Confederations cup and is likely to play in two weeks’ time with either Medina of Ghana or Mas of Morroco.